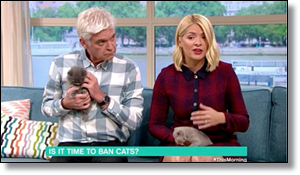 A guest on This Morning is calling for cats to be banned in a bid to save the birds and 'help them thrive'. Sally Jones appeared on the sofa to discuss a proposal to phase out cats in a New Zealand village to protect areas of The Bush and wildlife. The journalist claimed that cats are 'evil' and that 55 million birds are killed each year by pets. Sally told hosts Phillip and Holly, Phillip Schofield and Holly Willoughby: "I was watching a beautiful yellow hammer on our bird table... and within about five seconds a big grey cat had jumped on it and crunched it. "There's something we can do about cats, I think there's lots of things we can be doing as humans... there's lots we can do but one easy thing we can do close to home is control the number of birds out cats kill."